Years ago when I was still a diligent n00bie wannabe cruiser, I used to go to boat shows and attend seminar after seminar, eagerly listening to the gems shared by experienced sailors. There were many useful tips of diesel maintenance, keeping boats warm and dry in the winter, weather, and navigation. One of my favorites was delivered by a cruising author of cookbooks on the topic of provisioning. She was light, humorous, generous with her time and experience. She good-naturedly related arriving on her new husband's boat to find a bilge full of mysterious canned goods whose labels had long since dissolved and bags and bags of rice and beans. This author was delighted to let us know we didn't have to eat that way as cruisers. No need to stock up with all those staples, because she quipped, "People in other countries... they eat!" We all laughed. This was wonderful news, and it made perfect sense. We could travel the world with our favorite spices and sauces, purchasing local produce and meats en route. We'd shop at local markets, purchase locally grown veg and fruit, eat a lot of fresh fish caught by ourselves or by the friendly fishermen in the islands and villages of our travels. Provisioning would be cheaper, fresher, and incidentally we'd be learning more about the places we visit. In retrospect, I am absolutely positive this woman did not cruise the South Pacific. If so, she would have amended her blithe comment with the sobering realization that while people always eat "duh! ", in many places what they eat is either: (1) limited in variety; (2) extremely expensive; and/or (3) dominated by starchy white carbohydrates. Since leaving Mexico, we have seen one (ONE) 1 -one- super market worthy of the name... in Tahiti. We have seen thousands of small magazin/tiendas which carry an extremely limited supply of exorbitantly priced canned and dry goods, potatoes and onions, and a truly eye bogglingly priced freezer of frozen meat which looks like it has been there since WWII (both the freezer and the meat it contains). One aspect of our Palmerston experience that was very educating was the meals. Each day, our host family served us a delicious and incredibly generous mid-afternoon supper. While I can say without reservation that the food was copious and yummy, a dietician would be quick to point out that it consisted of two food groups: protein and white carbos. Mostly, we were served fish either in sauces or grilled. For variety, there was an occasional chicken or sausage dish. To accompany this every day was an enormous pan of white rice and a stack of white bread buns. We also tasted of pastas and bread fruit, potatoes, and kumara in a varied presentation of baked, stewed, grilled, and fried. In our week there, we never saw a fruit -- fresh or canned. We never ate anything green or crunchy - fresh, frozen or canned. Everything we ate could be made with onions and root vegetables, seasoned with minimum of tomato sauce. And this, quite frankly, is how a good fraction of the South Pacific eats. Compound the limited diet with even more limited availability. There are no large farms here producing tomatoes, fresh greens, and fruit. Families who do supplement their fish and rice diets with produce, do so by growing it themselves. Throughout the islands, we see homes whose edible landscapes make our mouths water. Everyone has a few banana, papaya, mango, or pamplemousse (only in the Marquesas) trees. They carefully pot garden some tomatoes or squash, beans, bokchoy, or chives. But these efforts are for the family, with only surplus being carried to a local stand or truck market for sale to neighbors and the desperately vitamin deficient passing yachties. You can send the children to particularly prosperous homes, let them stand outside with their mouths watering, and sometimes the owners will generously hand the kids a citrus or banana. You can not as provisioning guru of your boat, however, assume that these cottage gardens are going to become a regular source for your larder. I am particularly bitter this lovely morning in Niue. In the pre-dawn hours, DrC drove me ashore so I could attend the weekly market. After spending the day driving around the island yesterday, I had high hopes for a successful haul of papayas, watermelon, and tuna. However, all we found were shucked coconuts, bead jewelry, and fried donut balls. So instead, I am going to have to wire my mother and ask her to sell the family silver so that I can visit the market this afternoon to purchase a bag of potatoes, one of onions, and a few bags of frozen mixed stir fry veg. I do not regret a single can of tomatoes, peaches or pears we loaded in Mexico. I applaud my foresight in simply sinking the boat with pimentos, mushrooms, sundried tomatoes, and fresh frozen basil. Were I to do it again, the only thing I would change is to load more peanut butter, maple syrup, and probably about a thousand pounds of dried fruit. Alternatively, we need to convert Don Quixote into a cottage garden. We'll kick the girls off, turn one of the cabins into a green house, and grow beans and lettuce and alfalfa sprouts from hanging baskets in the cockpit. Sailing the farm is looking better and better. But we really are going to have to catch fish instead of just dragging a line behind the boat across half the planet. Hiya Toast this is SV Carinthia here in Fiji - there is ample produce here on the main land etc etc - but small islands simply have no ability to sustain agriculture - & the atolls of the tuamotos - rings of coral with sand NOT soil - all have their salad flown in - except for Raroia - a local had a hydroponic garden - it's just expensive and impossible. I came across your blog and have been skipping my way through it. Quick question - it sounded like back in NZ you were going to come back soon and sell the boat. What changed? I am beginning to consider a trip, perhaps less amibitious with my family of 5 as well. 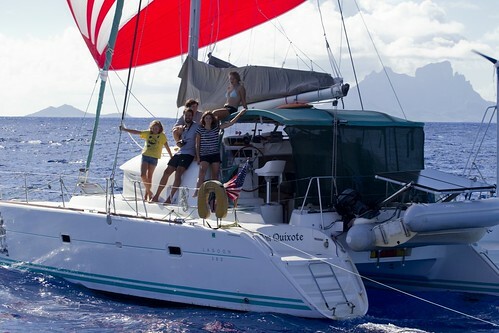 Have you been happy with the Lagoon and with choosing a catamaran?